It’s a rainy Monday in January. I have just finished my dentist appointment. Still under the influence of mild pain, I take the M1 to Hackescher Markt, one of the most hip areas in Mitte, to do some soul-writing and reflecting on the last year before I meet a friend for what was supposed to be a brief coffee encounter, after which we won’t see each other for a while. Just another day at the Café Cinema. I get there shortly before 12pm, which is when the café opens. However, as usual in Berlin, punctuality is of essence, so I spend the five minutes before the opening wandering around the passage just around the café that stretches to the back building hosting the Anne Frank Museum, a comic book shop, and – at any given time – a guided group of tourists in awe of the sight of the local graffiti and charming sketchiness of that small hidden corner in the midst of the Mitte buzz. A perfect time to reflect on what makes this café so special for all of us, regular visitors, who find inspiration in its old walls covered with vintage pictures and memories of the 20th century cinema. Café Cinema is supposedly the oldest café in the Hackescher Markt, one of the rare places in Mitte without a heavy tourist vibe to it. Most of the time, the café is crammed––characterized by its romantic candlelight and reflectors, rather unpretentious in its feel, it is the ultimate refuge from the real world into a movie-themed realm. Intense talks and the atmosphere of an old-fashioned bar give this place a mid-‘50s vibe, reminiscent of Paris or Vienna where existentialism was discussed with wine, cigarettes and good company. That said, Café Cinema is perfect for paper-writing, but not so much for serious laptop work. It’s a budget-appropriate place with great coffee in Mitte, very much fit for rainy days or evenings with its warm and snuggly feeling. 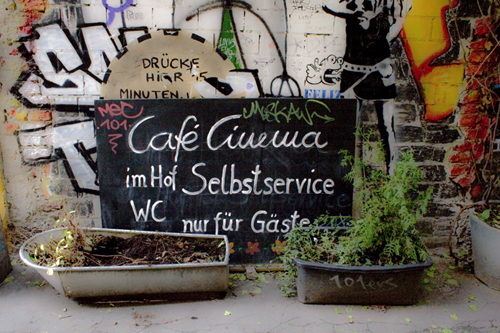 With a spacious smoker’s room – decorated with vintage cinema photographs – outdoor seating in the courtyard for sunny days, and the most appropriate architectural placement for observing people and imagining stories, the café is one of those Berlin specialties that offer an escape into a different time and place. Furthermore, its cinematic associations are not purely aesthetic – the café is located right next to a cinema in the Hackesche Höfe, so if seeing old cinematic exhibits inspires you to watch a good movie, make sure to combine visiting both of these places for an unforgettable day. 12:00 The café finally opens. I am the first customer, generously taking up the big couch and starting to write about my last few weeks, as the waitress is still lighting up the candles on every table. Soon thereafter, I am enjoying my “morning” coffee – one of the best ‘Milchkaffees’ in the city. It’s a slow, cloudy day – the passers-by look into the café drawn by its romantic vibe and cozy setting. 12:35 In only half an hour, the café is half-full. Berliners pursuing a break from work and a few tourists that luckily stumbled upon this place, couples and single people, young and old, friendly and smiling faces start to fill up the space. I am reflecting on the people – the rushing lines of faces that I will never see again, expressions I will not remember in just a few hours, walk swiftly up and down the street outside. A meditative experience, one can say. How busy these streets are, how crowded Mondays feel. Inside plays this beautiful music you lose yourself in, taking a break from the everyday burdens of our fast-moving modern life. 14:05 The friend I am supposed to meet finally arrives. I am almost done with my Milchkaffee, and, inspired by the same lady sipping on her red wine in the early afternoon, I ask him to order me an early glass of wine too. My afternoon has started reflectively anyways, so I might just live this day indulgently and follow my innocent cravings. It proved to be a good call to make. Upon his return, I realize I get more change than should have been the case. The waitress is assured I paid for my coffee earlier, and would not accept the money. I am certain I didn’t. Well, it is a lucky magical day – with what in my eyes shall remain a free coffee and early wine. 14:50 As dark Berlin winters always have it their way, the light outside is slowly fading into a sunset without any trace of the actual sun. The cosmic ambiance outside makes its way onto the old faded pictures on the wall. The shadows suddenly become darker, stronger in their presence, while the stories of the visual witnesses of the last century turn more bleak and dreary in their presence. All is suspended in the kind of energy that is felt when there are words unspoken and one feels so emotionally tired that she does not even feel like trying to speak. The state of evaded conversation, in which I am not entirely sure whether some misplaced sincerity is absent because I cannot feel it within my own self, as an essential relation, or because the person sitting across from me somehow feels distant. My intuition speaks to me in metaphors, and I wonder if human relationships can fade as easily as the pictures on the wall do on every sunset occasion. A state of passive living and not being in tune with the latent deep waters of intense feeling that lie underneath unveils itself to me. You acknowledge it, yet you are an exhausted soldier of life and decide to let it go rampant. 16:20 After four hours, my morning coffee and two glasses of wine, I am ready to go back home. I say goodbye to the nice lady who bought me wine and whom I indulged into snippets of conversation with – not even asking about her name. I have this feeling that I will see her again, at this same place, on another rainy future occasion. I also part ways with my companion, saying goodbye until later this year – a goodbye that strangely felt more final than ever before. The psychic bonds we form with people never really die, but sometimes they just cannot be material, real-life bonds anymore. He goes towards Hackescher Markt, I towards the M1. The M1 wakes me up from my imagination – was it all a dream? Did I just spend four hours in a café or a different realm? I guess I will never truly know that. Maybe that’s what is so special and charming about the Café Cinema at the end – it is half-real and half-imagined, half-here and half-anywhere.